I was somewhat distraught and amazed by your statement to the Tamil Media during the recent media briefing at Markham’s Hilton, when you had said according to David Poopalapillai, the spokesperson for the Canadian Tamil Congress (CTC) that “…Canada acted against its own interests by listing the Liberation Tigers of Tamil Eelam (LTTE) as a terrorist group in 2006.” And that bothers me and should bother other Canadians across the country too. What Canadian interest were you talking of? I wish you had elaborated. I thought this whole exercise of banning the Tamil Tiger terrorists was another step towards wiping out international terrorism after the 9/11 event, and safeguard Canada’s territory and her 33 million people from terrorism. And Tamil Tigers were the top-dog-terrorists, ruthless and serial killers worse than Al-Qaeda. So you representing the Conservative party and the Government of Canada is now on your knees to the sympathizers of the most ruthless terrorist group in the world, the Liberation Tigers of Tamil Eelam (LTTE) aka Tamil Tigers to say that Canada is sorry for banning them and now understand the folly as the Conservative Government acted against Canada’s own interest. This is amazing stuff, Jason. Sweet Mother of Jesus, what’s going on in Jason Kenney’s head? I think he needs a valium. I suppose you have no choice but to follow the Government’s policy now on Sri Lanka. Hmmm….I shall make a mental note of this turn of events as I certainly will have to make a choice of which party to vote at the next federal election. Jason, to be honest, weren’t we Canadians other than the Tamil Diaspora scared of these Tamil Tiger terrorists who had assassinated two heads of state, Rajiv Gandhi of India at Sriperumbudur, near Chennai in South India, and President Premadasa of Sri Lanka in Colombo. And also Sri Lanka’s Foreign Minister who was a Tamil, Lakshman Kadiragamar, a former Foreign Minister Ranjan Wijeratne, the Minister of Industries C.V. Gunaratne, the Leader of the Opposition Appapillai Amirthalingam, a Tamil, and the list goes on. These Tamil Tigers decimated most of their rival Tamil terrorist groups and killed their leaders, Sri Sabarathnam (TELO), Uma Maheswaran (PLOTE) and K. Padhmanabah (EPRLF) together with 13 members of his politbureau in an apartment in a Kodambakkam complex in South India. So The Tamil Tigers had successfully spread their octopus killer-tentacles across 24 miles of salt-water over the Palk Strait and went on assassinating whoever said “No” to their separatist cause. This was not a small child’s play ‘cops-and robbers’ murderous achievement to ignore. This was Big! With this backgrounder of the Tamil Tigers, I fail to understand why you told the Tamil media that “Canada acted against own interests in listing LTTE (Tamil Tigers) as a terrorist group”.They were the New Mafia in Canada operating from Toronto, Montreal and Vancouver. 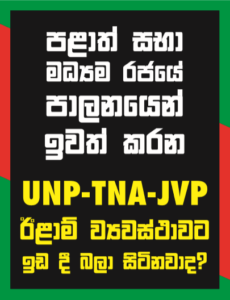 You banned the Tamil Tigers on April 10, 2006, and now, on January 26, 2013, almost seven years later you seem to regret that your Conservative party listed them as a terrorist organization as you seem to think it was ‘against our own interests’. That is amazing stuff, Jason. What interest are we talking of? By December 2000, according to secret intelligence documents, eight non-profit organizations and five companies were operating in Canada as fronts for the Tamil Tiger terrorists. By that time the Liberal government had been provided the first official confirmation that Canada had been used as a base for Tamil Tiger murderous operations overseas like specialized suicide bombings and political assassination. And yet the Liberal government’s Prime Minister Jean Chretien and his finance Minister Paul Martin defended their moral and financial support of the groups that the Canadian Intelligence reported , and accused the opposition members of parliament like you of being motivated by “racism” rather than genuine concern for national security. Was that true? But with your statement to the Tamil media in Markham on 26 January 2013 when you said “…Canada acted against its own interest by listing the Liberation Tigers of Tamil Eelam (LTTE) as a terrorist group on 2006”, there seems to be an accumulation of an extra secretion of earwax in your ears which had blocked them. That is unfortunate for the innocent Sri Lankans back in that island nation exposing them to a possible second wave of Tamil Tiger terror in Sri Lanka. So Jason, you told the Tamil media that “…Canada acted against its own interest by listing the Liberation Tigers of Tamil Eelam (LTTE) as a terrorist group in 2006.” Alright then, let’s spit out what comes next in the natural logical progression of the planned events on Sri Lanka by the Conservative Harper Government?